International Series of Monographs in Natural Philosophy, Volume 12: Current Algebras and their Applications provides an introduction to the underlying philosophy and to the technical methods associated with the use of the Current Algebra for the investigation of questions in elementary particle physics. 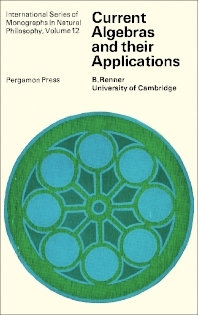 This text contains 10 chapters and begins with the preliminary concepts and basic ideas of current algebras. The next chapters deal with the approximate symmetry and the dispersion theory of current algebras, as well as the current algebra sum rules with PCAC. These topics are followed by reviews of the principles of the low-energy theorems, the Schwinger terms, and the features of the dispersion theory. The last chapter examines the possible connections of current algebras and dynamics. This book will prove useful to mathematicians, physicists, teachers, and students.